After tooth loss, the resulting gap in your smile can greatly detract from your appearance and diminish your oral function. To restore smiles that have lost multiple consecutive teeth, Dr. Jon Marc Van Slate offers traditional and implant-supported dental bridges at his Houston, TX, practice. A dental bridge is a custom restoration made of multiple artificial teeth that have been fused together. The type of bridge that is right for you will depend on your needs, goals, and budget. To schedule a consultation and learn more about dental bridges, contact our practice today. Both traditional and implant-supported dental bridges are used to replace up to three consecutive teeth in a row. Traditional bridges are secured by dental crowns. If you will be receiving a traditional bridge, Dr. Van Slate will begin by reshaping the teeth on each side of the gap in your smile. 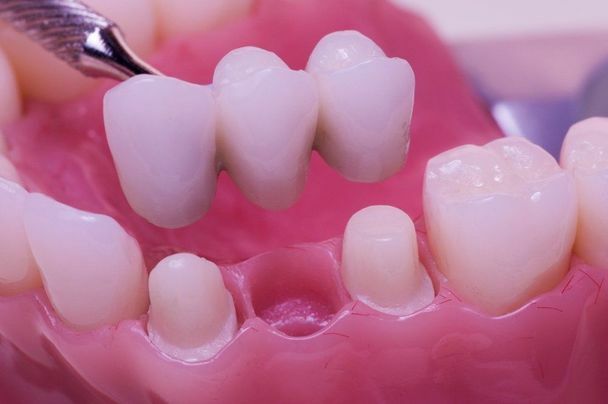 This will ensure that your bridge has a secure fit and remains in proper alignment with surrounding teeth. Next, we will take detailed impressions of the reshaped teeth. The images will be sent to an advanced dental laboratory, where technicians will use them to craft your bridge. Most patients choose to have their bridges made of dental-grade porcelain, which mimics the look and sheen of natural enamel. However, we can provide bridges in a range of materials. The fabrication process can take several weeks, but we may be able to have your bridge rushed if you are seeking a quick turnaround time. Once your traditional bridge is ready, you will return to our practice. Dr. Van Slate will use dental cement to firmly secure the new bridge in place, restoring the beauty of your smile and bringing balance back to your bite. The introduction of dental implants has allowed patients to experience bridges with an unparalleled level of stability. Implants are small metal posts that are placed in the jaw to serve as artificial tooth roots. In order to qualify for an implant-supported bridge, your jaw must be strong enough to support the titanium implant posts. If we find that your jaw is too weak for treatment, we may recommend a bone grafting procedure to help you qualify. Implant-supported bridges will never slip out of place, and you can continue to enjoy all of your favorite foods. Receiving an implant-supported bridge is a multi-step process. During your first appointment, we will place dental implants directly into your jawbone. The implants will be left to heal for several months, which will allow them time to completely fuse with the surrounding bone. Once healing is complete and your permanent bridge is ready, we will attach it to your dental implants to complete treatment. Many patients prefer implant-supported bridges because they offer several unique benefits. First, they do not require adjacent teeth to be reshaped. Since they are secured by artificial tooth roots, implant-supported bridges will never slip out of place, and you can continue to enjoy all of your favorite foods. Finally, dental implants return stimulation to the jaw, which helps to halt the bone recession that naturally occurs after tooth loss. To schedule a restorative consultation with Dr. Van Slate, reach out to our practice today.